Before there was the Islamic State, before YouTube videos that seduce Europe's Muslims to join in the jihad, before Twitter and Tumblr and the many tools of recruitment on the Internet, there was the local mosque. Concerns about Salafist groups and their unwavering impact in Europe have reemerged of late, the result of numerous investigations into ties between European mosques and terror financing organizations. Added to this is a growing unrest within the European Muslim community as it struggles with its own identity and future. In the process, counterterrorism experts and government officials have increasingly been forced to acknowledge that "bombing the hell out of ISIS," as the U.S. president-elect has sworn to do, won't be enough to solve the problem. Salafism – the orthodox, strictly sharia-based interpretation of Islam championed by the Saudis and at the heart of the Islamic State and similar extremist groups – is thriving in the West. And as many experts agree, Salafist ideology is where violent jihadism finds its home. Now Europe is starting to crack down. For years, governments largely shook their heads in passive, ineffectual dismay over the Salafist mosques in their communities. But the recent rash of terror attacks and concern about increased radicalization among European Muslim youth have spurred officials into action. In November, Germany outlawed the Salafist group "True Religion," which distributes German translations of the Quran, calling it a "collecting pool" for jihadists. According to the New York Times, more than 140 "True Religion" members have joined ISIS in Syria or Iraq. An estimated 820 Germans are believed to have joined the terror group, about a third of whom have since returned. In the weeks following the ban, German media exposed further evidence of Salafist activity, thanks to a leaked intelligence report. Gulf states have actively supported Salafist mosques, schools, and associations, the report revealed, building "missionary movements" funded in part by the Saudi Muslim World League, Sheikh Eid bin Mohammed al-Thani Charitable Association, and the Kuwaiti Revival of Islamic Heritage Society, which the U.S. accuses of having ties to al-Qaida. Yet the Saudi ambassador to Germany denies his government funds imams or maintains ties to Salafism in Germany, reports the Independent. Further, he insists that his government "does not build mosques." Cross the border into Belgium, however, and such claims quickly crumble. Rather, the country's largest mosque, located in the midst of Brussels' EU Quarter, is widely known as a "hotbed for Salafist radicalization," according to Die Welt. And it has been financed for nearly 50 years by the Saudis, who also train its imams. The Saudi connection was part of an oil financing deal made between the Gulf state and then-king Baudouin of Belgium in 1967. In exchange for favorable oil prices, Saudi Arabia received a 99-year lease on the property and the right to train imams. Indeed, according to the Washington Post, "Saudi Arabia ... invested in training the imams who would preach to a growing Muslim diaspora in European countries, including in Belgium." Essentially, as Die Welt reports, Belgium "gave the House of Saud carte blanche to spread the message of Salafism." The Islamic Cultural Center at the Great Mosque of Brussels continues the tradition, parlaying its message into the classes it offers to about 700 children, and into its training of a new generation of imams. This kind of deep integration of conservative, Salafist Islam into the communities of Western Europe is, however, not unique to Belgium. In the Netherlands, officials abandoned an effort earlier this year to outlaw Salafism. It would "intervene in people's personal religious beliefs," thereby violating Holland's constitution, Social Affairs Minister Lodewijk Asscher said at the time. 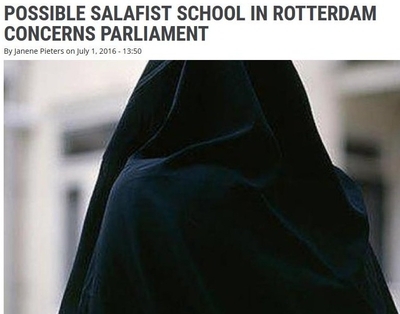 Yet at a Salafist Koran school in Utrecht, students are taught to reject Western norms in favor of their orthodox Muslim ideals, according to four former students, who independently described their experiences to the Dutch newspaper Volkskrant. And it isn't just in Utrecht. In Amsterdam, conflicts, sometimes violent, have broken out in mosques between the more moderate old garde and a more conservative, younger generation, as Dutch Muslims battle over their identity. "It is five to twelve," city council member Sofyan Mbarki, himself a Muslim, warned last summer about the growing Salafism in the Amsterdam mosques. Several recent investigations into Salafist organizations across the country have turned up some eye-opening links to terror groups. In Eindhoven, for instance, the Al-Waqf organization was recently accused of having financial ties to al-Qaida. One of the country's largest Muslim organizations, Al Waqf runs the Eindhoven Al Fourqaan Mosque. Its imam, Ismail Bakri, according to Holland's NRC Handelsblad, also is the treasurer and co-founder of the Association des Savants Musulmans (ASM) in Bern, Switzerland. The ASM also has offices in Qatar and Gaza. The ASM is no ordinary Muslim group. The United States identifies two ASM board members as terror financiers: Kuwaiti Abdul Mohsen al-Mutairi allegedly raised money for Jabhat al Nusra in Syria, and Yemeni politician Abdel Wahab Humaiqani is alleged to have financial ties to al-Qaida. The U.S. also believes he was behind a 2012 terrorist bombing in Yemen. That's not all. ASM is allied with the Qatari Eid Charity, research by Dutch analyst Carel Brendel shows. The other name for the Eid Charity? Sheikh Eid bin Mohammed al-Thani Charitable Association – the same group cited by Germany's intelligence report on Gulf-state funding of Salafist mosques and schools. Dutch officials put a stop to ASM's plans to build another institute that included a school, in Rotterdam, noting links exposed in WikiLeaks documents to Hamas and suspicions it provided funds for Al Nusra. Moreover, the NRC report says that charity founder Abd al-Rahman al Nu'aymi is thought to be a major fundraiser for al-Qaida in Syria and Iraq. Nonetheless, Dutch directors of the planned project insist that there is no affiliation with extremism. True or not, Rotterdam has plenty of other problems, as a number of terrorist arrests throughout the past year have made clear. And nationally, extremist ideologies are working their way into the mainstream. In one shocking recent incident, the Meldpunt Internetdiscriminatie (MiND), which addresses concerns about discrimination on the internet, refused to intervene when several Dutch Muslims responded to an online article about a gay group in Morocco by calling for gays to be burned and beheaded. In a letter to the unnamed person who filed the complaint, MiND wrote, "the comments should be seen in the context of Islamic beliefs, which from a legal standpoint keeps them from qualifying as insulting. Some Muslims believe that the Koran states homosexuals should be killed." In other words, if the Quran calls for homosexuals to be beheaded, then there is nothing wrong with Muslims calling for homosexuals to be beheaded. Context is key. To its credit, after a Dutch web site posted MiND's letter online, the outcry that followed led to a "re-evaluation" on MiND's part, and the determination that religious context should not apply to calls for violence. A similar situation took place in Germany in 2007, when a judge denied an abused Muslim woman a divorce, citing a Quranic verse that encourages husbands to beat "disobedient" wives. The case was later retried. For the most part, however, European officials seem at a loss, unsure of how to handle the new Salafist chic. Seeking answers in the aftermath of the attacks in Paris and Brussels, reporters at Holland's Financieel Dagblad turned last March to one of the best-known faces of moderate Islam in the Netherlands, Ahmed Marcouch, a Moroccan-born former Amsterdam police officer who now serves in the House of Representatives. Marcouch has been outspoken about the dangers of Salafism, which he has called a totalitarian, anti-democratic ideology that is "spitting its poison into our society." "Is the Netherlands too naïve, then, about Salafism?" the FD asked him.